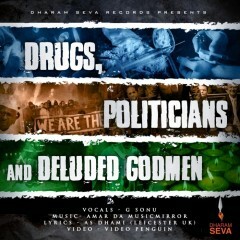 Their latest release due out on the 16th June ‘Drugs, Politicians and Deluded Godmen’ highlights just three of the top issues that are having a devastating effect on the day to day life of the people of Punjab. Upcoming punjabi singer, G Sonu displays his masterful vocals on the song and encapsulates the pain and suffering that these issues have caused. Prepare yourself to be told of a situation where drugs have almost wiped out a generation of youths that were once promised so much. Families and affected others have been dragged through this journey of addiction with very little hope and encouragement for the future. Punjab once famed for being the battleground of fighting oppression has now turned in on itself with those very politicians fighting for people’s rights and privileges, now securing shady deals and serving self-interests. When hope has gone and people are left feeling vulnerable many turn towards god and seek spiritual help. This can also be a hunting ground for many Fake Godmen to come and pick their prey and manipulate for their own gain. This powerful title track will provide a platform for many to wake up and educate themselves of just some of the issues that are plaguing our beloved Punjab. Dharam Seva Records have never shyed away from raising controversial issues on their successful platforms and will continue to do so in the future.